That belief is one major reason DeWine made the second visit of his still young first term as Ohio’s governor to Shawnee State University Tuesday morning. According to DeWine spokesperson Breann Almos, the governor arrived at the Portsmouth based university about 10 a.m., and immediately began meeting behind closed doors with SSU Interim President Jeffrey Bauer along with the university’s board of directors. Bauer later said he was more than happy to have the opportunity to meet with DeWine. Bauer added one goal of SSU is to have an open access policy for all students, regardless of past academic performance. He said that can put some unique financial strains on the institution. “I think he understands the mission here,” Bauer said of DeWine, adding any aid coming from the state is more than welcome, though neither he nor the governor mentioned any specific promises publicly. After meeting with Bauer and other university administration, DeWine spent about 45 minutes touring the SSU Advanced Technology Center. As DeWine wandered about the first floor of the technology center, it was noted all the high-tech gizmos on display in being used by students, from 3D printers to robotics equipment as well as plastics modeling and production machines, which were donated by various businesses. DeWine took the time to speak with a couple of students inside the high-tech facility. He later said those students had lined up jobs upon their graduation starting anywhere from $60,000-$70,000 annually. In comments he made later to the Daily Times, DeWine clearly was impressed by those numbers. A recent study done by Ohio University, the results of which have appeared in the Daily Times, showed if the Appalachian counties of Ohio were combined into a separate state, that Appalachian state would be the second most economically distressed in the country. DeWine said programs such as SSU’s technology center clearly are key to jump starting the southern Ohio economy, describing SSU as “very important” to the future of the region. “The goal is to ensure (students) get the tools they need to make it,” DeWine said. Bauer only became the head of SSU in October, moving up from the provost’s position. At the time, in an interview with the Daily Times, he didn’t sugarcoat the fact the school had lost students and funding. Bauer said in the 2011- 2012 school year, SSU had about 4,700 students. That number now sits at about 3,200. “Especially this year, we had a major falloff in enrollment,” Bauer said in October. On Tuesday, Bauer said there is some good news coming SSU’s way in terms of enrollment. He said SSU made major investments in its admissions and recruiting functions and, while final numbers will not be available for some time, he expects next year’s freshman class to have increased about 10 percent. “For us, that’s huge,” Bauer said, noting SSU had experienced 6 percent enrollment drops in previous years. Bauer also touted progress in terms of the school’s online offerings, something he held up in October as programs key to SSU’s future. SSU’s president clearly hopes to attract large numbers of nontraditional students, students who want to earn a degree while having no more than a limited physical presence on campus. He admitted it may take five to six years to fully rollout the online programs. SSU long has touted its computer gaming program as one of the best in the country. Bauer has described it as one of SSU’s key draws. 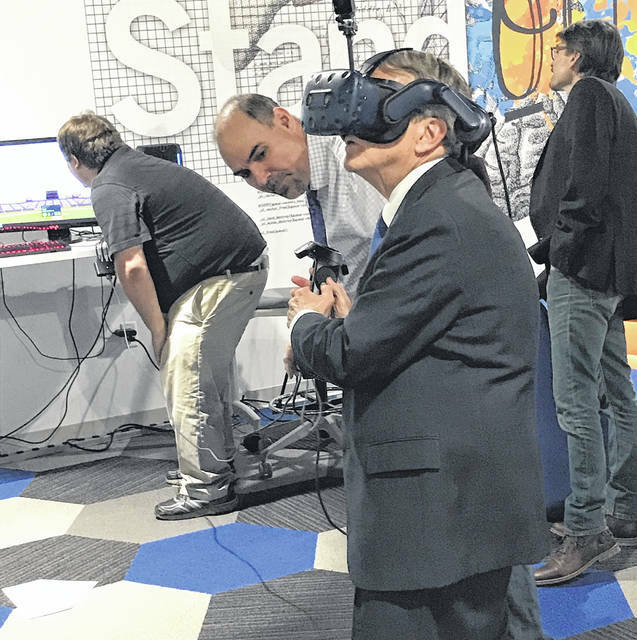 DeWine got a small taste of that program, trying out a virtual reality baseball game set in a minor-league stadium. In the game, DeWine tried to hit a 70 MPH fastball. He didn’t succeed. The virtual reality baseball game conceivably could be part of a baseball themed attraction of some kind in downtown Portsmouth or Boneyfiddle, noted local businessman Paul Yost, who was on hand Tuesday to help DeWine try out the machinery. Originally, DeWine was scheduled to spend some time with SSU students in the school’s student center. Those interviews did not take place, Bauer said due to time constraints. After leaving SSU, DeWine was scheduled to visit buildings in the Minford Local School District and later in the day spend some time at Hocking College in Nelsonville. DeWine said he was making it a point to personally visit several colleges and universities around the state early in his term as governor in order to emphasize their importance to Ohio’s economy.